I decided to follow up and report that today is the day I finally decided to take the rest of it off, my hair that is! I had a different idea for a post today, but after looking at the calendar and reflecting a bit, I changed my mind and decided to follow up on the Should a Chemo Patient Shave the Hair Off and If So, When? post from October 7th. That particular post was probably the most difficult one for me to publish (so far) due to the very personal topic of going hairless. The picture was certainly not one of my most flattering either! Surprisingly, to me at least, that also quickly became my most viewed post thus far. I guess perhaps every chemo patient relates most closely to this going hairless dilemma. This day marks a special juncture in my cancer journey. Not just because of the hair shaving decision, but because it feels like a turning point of sorts for a variety of reasons. I have finished chemo (I’ll be posting more on that next week), I have reached the five month point since my bilateral mastectomy, I received my final tissue expander filling, I will be having more surgery in exactly one month, it’s November (the post-chemo month I have been longing for since July), I now begin the next phase of treatment -hormone therapy, I have been blogging for two months and I have determined I will begin looking for that elusive “new normal” with redefined diligence. In other words, I guess I am moving on. I know I will be on this cancer journey for the rest of my life because once you are diagnosed, it never really ends. None-the-less, today seems important for these and other reasons as well. Later today when I take the scissors to my hair and then the shaver to my head, I will still cringe and probably even shed a few more tears. I will also silently congratulate myself on making it to this point and “doing it my way” as the song says. I kept my hair, not much I must admit, but I kept it until I was ready to shave it completely off. Some people feel more in control if they shave it off early on. The opposite was true for me, I chose to wait and let it fall out on its own. Again, we are all different in how we handle this and that’s how it should be. Cancer patients often feel like they are losing control and this is one area that is literally in their hands. Whether it’s something as simple and “unimportant” as keeping your remaining strands of hair or something more crucial such as deciding upon a treatment option, go ahead, speak up! Don’t be afraid to voice your concerns or opinions. Ask as many questions as you need to. Let yourself be heard. It’s your body. It’s your cancer journey. It’s your life. 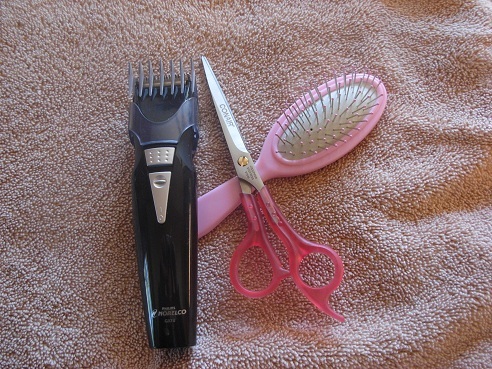 Now it’s time to go get those scissors and that shaver! WHAT WAS THE HARDEST THING YOU EVER SPOKE UP ABOUT? 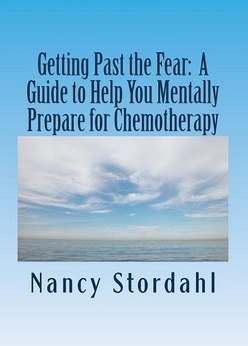 If you are undergoing chemotherapy or about to begin, check out my book on how to get past the fear. Click on the book image to learn more. Nancy, that’s the thing about cancer, facing crap you never thought you’d have to deal with, but you’re doing it beautifully. I admire your strength and your great ability to write about it. Stacey, Thank you. It seems to help me to write about it and hopefully it helps a few others as well. And you are right about facing a lot of crap! What’s the hardest thing I’ve ever spoken up about ? Honestly Nancy, I don’t think I’ve done it yet. Good food for thought. Anna, Thanks for stopping by and commenting. Well, maybe that’s a good thing that you haven’t had to yet, I don’t know. How’s that cute dog? Anna, Thanks for commenting again! Well, at least he’s cute!! ha. This is kind of deep for a blog comment, but: The hardest thing I ever spoke up about was asking my mom what she wanted to wear in her casket. She planned her entire funeral and service on her own, and I wanted to make sure it was carried out exactly how she pictured it. It was the hardest thing I have ever done, but I am glad I asked. It was one of the endless things that brought us closer together during such a difficult (for lack of a better word) time. Sami, Wow, you’re right this is pretty deep and I’m so glad you shared it here on my blog. It must bring you some comfort now that you helped your mother with such an intimate thing like that even though it had to be incredibly hard. I bet you had everything planned beautifully and I think your mother was and still is very proud of you! Nancy that was a tough call for you. I admire you. Think I would have been at the hairdresser myself. Chez, It was tough, but now I’m glad that part is behind me, shaved the rest off last night! You brought up some excellent points. Losing your hair is an incredibly emotional experience because of what it represents. It is your journey and like you said, you’ve made it through some of the toughest parts of your journey. Your seem to be handling it beautifully and even if you aren’t thats ok too. The important part is being able to reach out when you need support. Lauren, Thanks for your comments. I enjoy hearing everyone’s viewpoints. It is a journey with some spots rougher than others. The hair dilemma seems to be a universal rough patch. I’ll have to check out the breast cancer registry. 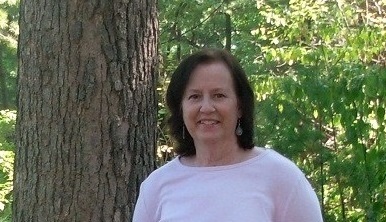 Nancy, I highly recommend learning more about the breast cancer registry at http://www.breastcancerregistry.org. You just go on and answer a few questions about your experience with the belief that with one more, we know more. Lauren, Will do soon. Thanks. Post Chemo – Who Is That in the Mirror?